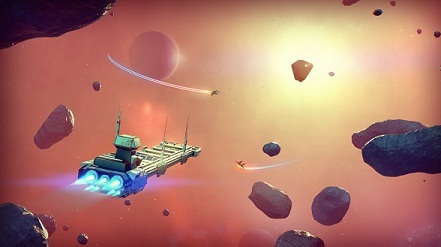 In No Man's Sky, you need the Atlas Pass V1, V2 or V3 to open doors and cargo containers / chests. If you want to find the appropriate access pass, then you have to embark on the search for a blueprint. In our guide, we show you how to find the blueprints. - Get the star map and select a solar system which you want to travel using the warp drive. Once you have arrived there, you have to repeat this process until you have arrived in another arbitrary system. - Scan each system with your spaceship. Especially the third, because here you will be informed that there is a monolith located in this solar system. Fly there and interact with the building. - Then you will be displayed on your map an Atlas interface (blue icon). It is possible that this interface is far away many systems, so get your warp drive and make you way. - Land in the Atlas interface, then you speak with the orb. If you have the opportunity to respond, decide for consent. Go back to your vehicle and then open the star chart. - You must now go to the bar with the Atlas interface so long between the systems until you discover an anomaly. But don’t forget to scan each system. - Make your way up to the labeled target and entertain the aliens. Then you will be rewarded with the blueprint for the Atlas-pass V1 and you can craft the Atlas-pass from 10 Heridium and 25 Iron. - Place the Atlas Pass V1 in one of your inventory slots, you will automatically have obtained access to spaces and objects marked accordingly. From now on you can access this pass anytime. Follow the Atlas Quest to obtain Atlas Pass V2 and V3 or try the following options. In No Man's Sky, to craft the Atlas a pass V2 you need 10 platinum and 20 zinc. However, it does not go without a blueprint. To find it you need to get to the operation centers. The door, which block the entrance with a blaster. You will not upgrade your multi-tool in this direction, you can shoot at the entrance. Then you must deactivate the alarm. Step into the operations center and search for the switch. Now you can search the blueprint for the Atlas pass V2. Repeat this process until you have found them. For this Atlas Pass you have to go a little more on the search. So need outpost on the planet, and interact with the signal scanner. This can lead you to a colonial outpost. Follow the signal and find the place. Here you need to look for a terminal / console in the building. Answer the riddle correctly, with a lot of luck you will be rewarded with a blueprint for the Atlas pass V3. Then you need only 25 titanium and 10 Chrysonite to craft the V3- Atlas Pass.